At some point a little over a decade ago, I was wandering through my community college’s periodicals section, and noticed the Simpsons on the cover of a magazine. The headline was something like: “Televisions Most Religious Family?” (I believe this is probably the article, although it references an apparently similar Christian Science Monitor piece) I’d generally stopped watching the show live at that point, probably after the tenth season. Not only did it not feel as good as it had, which is well-worn territory, but it didn’t feel as vibrant or as dangerous as it had back in the early days. The Simpsons was so establishment that Christian magazines were racing to claim it. This was quite a change from 1992, President George Bush famously gave a campaign speech that thrust The Simpsons firmly into the culture wars. The exact line had Bush declaring he wanted to have American families be “a lot more like the Waltons and a lot less like the Simpsons.” The Simpsons of that era were dangerous, apparently, dangerous enough that the conservative party’s President and his wife both felt compelled to attack it. Four years later, in “Two Bad Neighbors,” the Bushes appeared on The Simpsons. I’m sure there are personal and professional reasons that The Simpsons made the approach and the Bushes accepted, but I think there’s a larger, albeit simpler reason: this is the point at which people realized that The Simpsons wasn’t dangerous anymore. What better way to demonstrate that now, in its seventh season, The Simpsons was part of the establishment than by having a previously antagonistic embodiment of that establishment appear on the show? It’s not like “Two Bad Neighbors” takes revenge on George Bush, either. While he is the antagonist in the situation, he’s probably more in the right than Homer. Meanwhile, Barbara Bush is presented as a kind of Middle American saint. Together, they’re portrayed as fundamentally normal and decent people. This is hardly the stuff of biting political satire, and really, a couple digs aside (“And since I achieved all my goals as President in one term, there was no need for a second. The End.”), I wouldn’t really describe it as any kind of satire. 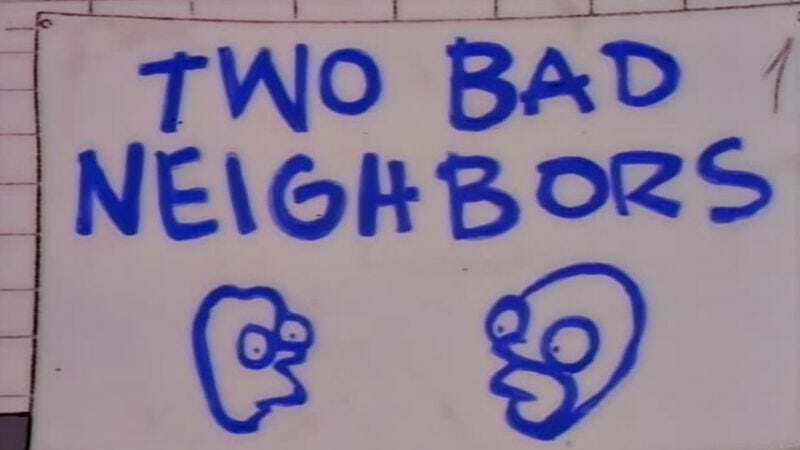 So in theory, “Two Bad Neighbors” shouldn’t be a very good episode. A comedy’s seventh-season slide into normality isn’t usually something to celebrate. But in theory, communism works, so you can be pretty sure that any idea that begins with “in theory” is going to have a turn. In this case, the turn is that such a reading of The Simpsons is based almost entirely on content, plot summaries, or individual minor events. The important aspect of The Simpsons, the thing that actually made it dangerous, and a trait that “Two Bad Neighbors” possesses in spades is that it’s formally daring. Go back to 1992, and consider what made The Simpsons so dangerous. It wasn’t the vaguely mature themes and situations, or the mild swearing—it was the form. It was that it was a cartoon, which for decades had been understood by mainstream America as a form intended to tell bland stories with the goal of selling children toys. Having that form be used to directly engage with, and make fun American life? Why, children might see that, and learn to be sarcastic! Being animated might be enough to make The Simpsons interesting, but the formal experimentation is what made it great. Take the layered jokes from the first few minutes. First, Homer and Bart come across a house that we, the viewers, haven’t seen before, and Homer acts surprised, as a conventional comedy character. Then Bart says it’s the house across the street, playing directly on how Homer’s ignorance matches our ignorance because the show’s “camera” doesn’t actually cross the street. It’s a joke about Homer, about sitcom character tropes, and about the limitations of television. Or look at the Simpson table during the rummage sale. Almost everything Marge is trying to sell is a reference to past episodes: the giant head Mr. Burns gives the family, a bunch of Malibu Stacy dolls, extra sailboat paintings, and “I didn’t do it!” shirts. Skinner shows up and asks about one of the non-reference items on the table, a motorized tie rack. After an amusing conversation, he drops another formal punch line: he only has the one tie, referencing the repetition of his animation (then he buys the rack anyway). The sequence finishes with easily one of the show’s top 200-300 scenes, when Homer gets the microphone from Flanders and starts clowning around and making the rummage sale go. Chief Wiggum grabs a crappy keyboard, and Homer starts singing and dancing. “Hey big spender!” “We surrender!” A perfect Simpsons microcosm happens immediately after, with Homer clowning around both hilariously and mildly cruelly to Flanders, Chief Wiggum remixing a disco song, and a throwaway character from moments before, a played-out joke of an archetype whose joke is how played out he is, dancing his way into America’s heart as the mob of Springfieldians/Americans lose interest and pay attention to something else. The main plot is also serves as a reference to Simpsons past. I was, perhaps, a little too quick to dismiss people who felt like The Simpsons could be a bad influence. The early, oft-used gag of Homer strangling Bart was something that could exist thanks to the show being animated, and I can definitely see why that would be considered a bad thing. But The Simpsons was doing a looooot more than just child abuse jokes. Certainly at this point in their seventh season, they’d earned respect as an intelligent satirical show, where the shock value was unnecessary, if still occasionally useful. 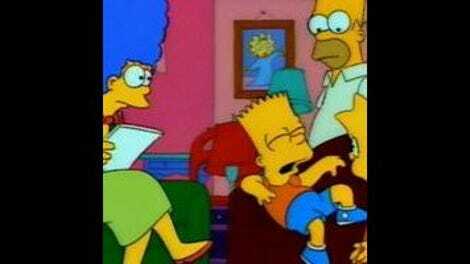 Hence the story of George Bush spanking Bart (“I begged him to stop, but he said it was for the good of the nation.”), and that being shocking to the Simpson family, serves as a rejection to the old choking gag. The situations are different—the whole point of the choking thing is that Homer can’t control himself, while Bush’s spanking is treated as a rational if disagreeable act. Still, whether it’s intentionally making fun of itself and how it’s perceived or not, “Two Bad Neighbors” manages to flip an old component of its reputation into an effective story of generational parenting disputes. Finally, the climax of the episode hinges on yet another meta-gag. As Bush and Homer prepare to grapple in the sewers, the former president mentions that Bart had destroyed his memoirs to trigger the spanking. Homer gasps, turns to Bart, and tells him “You didn’t tell me you destroyed his memoirs!” The music shifts, and the camera moves into position for Homer to take Bart by the shoulder and tell him to be honest, apologize, initiate a reconciliation, and all the stuff that comedies with good messages are supposed to do. It doesn’t happen—the camera whips around again to Homer in an action pose, shouting “Never!” to the demand Bart apologize. Violence ensues. “Two Bad Neighbors” consistently takes the expectations of the sitcom form and uses them against viewers for comedy’s sake. Ironically, in this case, it actually goes against Simpsons conventions as well here. Generally speaking, despite their reputation for being smart-alecky, satirical, even occasionally mean, The Simpsons was often defined by how often the family survived or succeeded by traditional forms of loving one another, sticking together, and doing the right thing. But in this case, Homer never does to the right thing. Even when Bush is convinced to apologize, Homer laughs in his face, and gloats. It’s one of relatively few endings where the show is downright un-Christian. The formal experimentation of The Simpsons means that the show’s danger was never really in what it said—it was almost always good-hearted and praised kindness—but in how it said it. Toying with viewers’ expectations of how stories should work has a lot more staying power than easily-ignorable (or cancellable) stories that directly attack conventions. I went into this episode expecting to write something about how the lack of danger in “Two Bad Neighbors” prefaced the show’s decline, an always-fruitful topic of discussion. For some reason I’d come to think that this was a relatively disliked episode of the Golden Years, although Wikipedia’s “Reception” page suggests that it’s actually quite popular, and deservedly so—this is a damn funny episode. “Two Bad Neighbors” is effortlessly playful, making joke after joke at multiple levels. At this stage of The Simpsons’ run, pretty much any content, even an antagonistic Republican president, could be plugged into the production system and turn out formally experimental and damn funny. The police unroll a blink-and-you’ll miss it RUMMAGE SALE DO NOT CROSS yellow tape obstacle. “Greatalicious.” “Scrumdiddlyiffic.” “Fine and dandy, like sour candy!” The Simpsons positions Bush as equivalent to the saintly-yet-annoying Flanders here. “Grover Cleveland spanked me on two non-consecutive occasions!” Not much for Grandpa or Lisa in this episode, but this line’s silly fun. “No, the man and his boy. Y’know, the boy is named Bart, I don’t know the name of the man. Bar, what’s the name of the man?” Barbara Bush’s saintliness here is hilarious if you, like me, read a few too many profiles of W’s life and her role as The Worst Bush. “Yoo hoo! It’s your sons, George Bush Jr. and Jeb Bush!” Speaking of, this is back in the day before he was W.
“So I thought to myself, what would God do in this situation?” “Mmhmmhahaha. Locusts!” Is this the best line of the episode? I think it’s my favorite.